One of my favorite places to use it is behind 'Star Gate.' They create a very interesting play of light and dark. 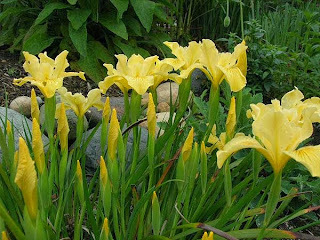 Both irises are good about giving good fall bloom in my garden and bloom at the same time. Most often, in my garden, the blooms will look like these below. The bloom often droops, not having the good lift of the picture at the top of the page. This could easily be the result of my hot late summer days, or it could be the lack of proper fertilization. But even in new beds, I've not seen the good substance that I see in photographs. What is the value of 'Over and Over' in our breeding programs? It should be a good breeder for rebloom. Although it not happen instantly, I believe that with a large measure of patience, and a few generations of both outbreeding and inbreeding, it will give us a path to tall, well-branched rebloomers with good substance in the colder climates. For those of you who are not genetic experts, it is important to know that plicatas like 'Over and Over' crossed to other plicatas will give more plicatas. 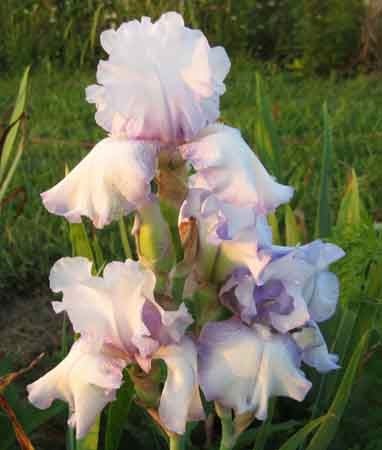 There will be occasional selfs (solid colored irises), but most will be similiar to 'Over and Over.' A plicata crossed to a self can give selfs, bitones, or variegatas (irises with yellow standards and red falls). Color must exist in the genetic family to be produced in the children, so my guess is that variegatas will be rare in these crosses. I've had one reblooming seedling from a cross of one of my older, but weaker, rebloomers by 'Over and Over', and there are several more crosses in the seedling beds that contain 'Over and Over.' Stay tuned for the results. Even better, try some crosses of your own with 'Over and Over!' Have fun! Apologies for the lateness of this review; we plan, and plan some more, and then one gets a cold. I don’t know about you, but all I can do when I get a cold is... rest, do nothing, and then rest some more. So, even though I had everything necessary to share this post with you about the new issue of IRISES, well it just did not happen. 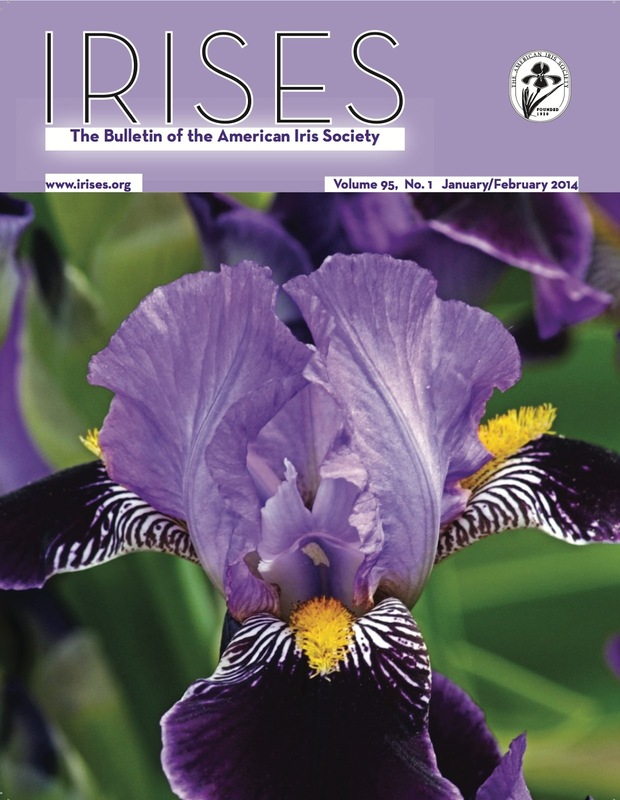 Riley Probst, the AIS Symposium Chair, gives us a historic review of the AIS Tall Bearded Iris Symposium. 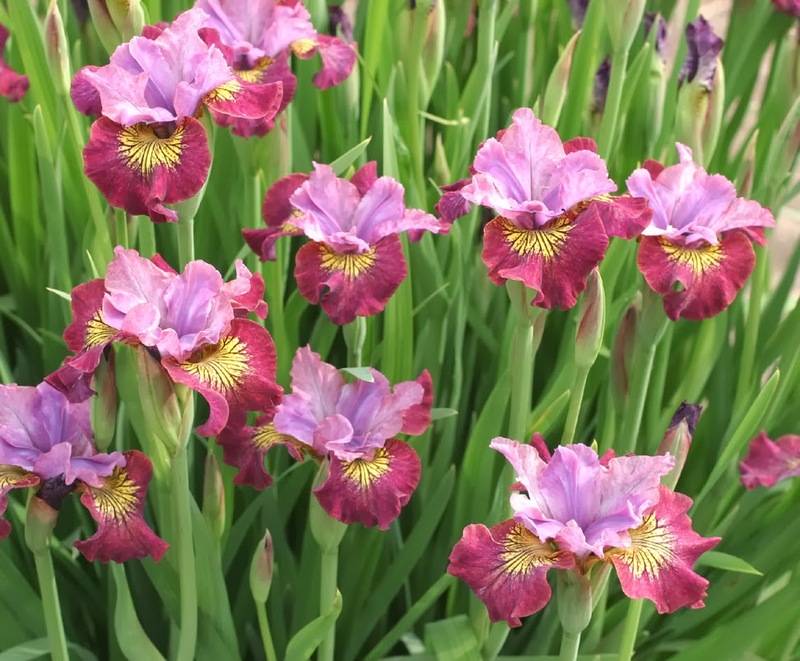 Who doesn't want to know how the TOP 100 Tall Bearded Irises list got started, and what are the current stats on TBs around the country? A very educational read. 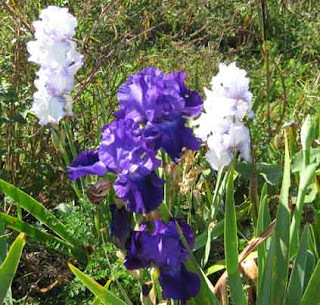 If you don’t know Robert Piątek you will have a change to meet him on an article called, Iris Hybridizer and Author from Poland. 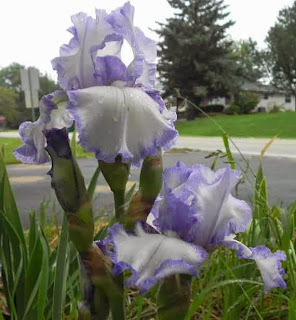 From his early beginnings as a forester in the District Zawadzkie National Forest, Poland, to his current work hybridizing irises, you will be enchanted to make his acquaintance even if on paper. 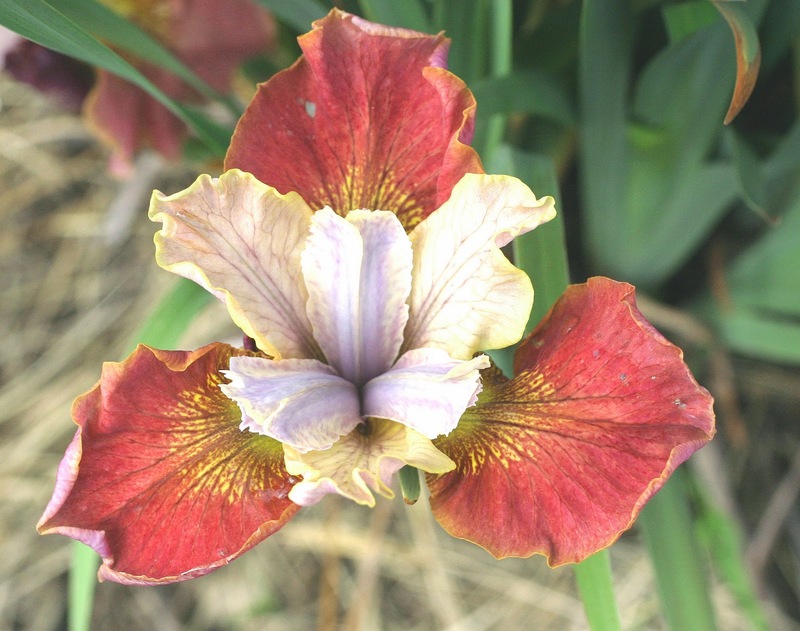 Don’t miss the beautiful iris pictures that accompany his introduction to the American public. 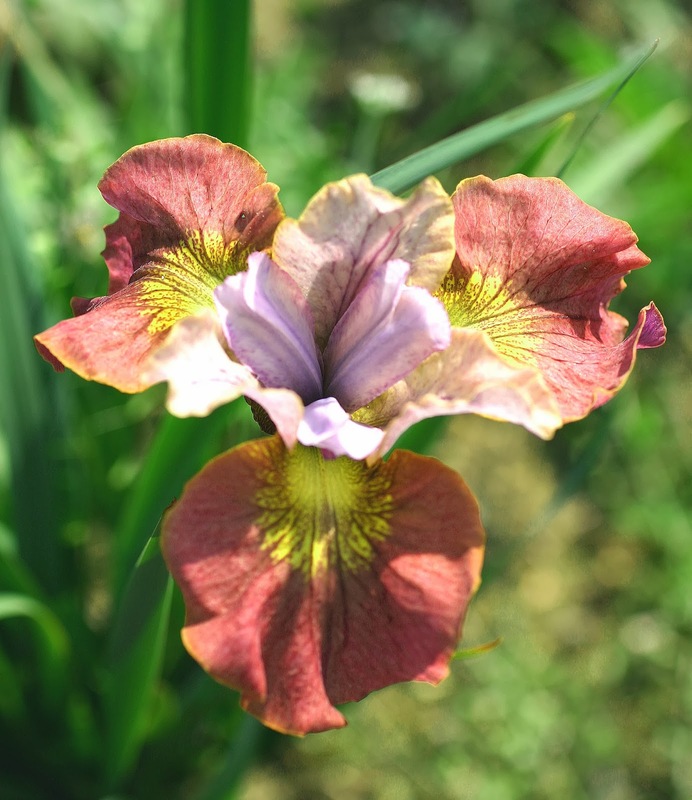 A fascinating write up about little irises may also catch your attention. The article called “Small is Beautiful” by Charlie Carver from Orcas Island, Washington. Don't miss The Winners of the 2013 AIS Photo Contest will also surprise you with their quality, and their display size, which this year is extra large. Check them out and you’ll know what I mean. 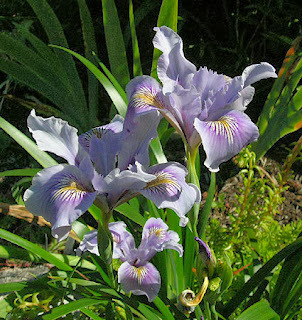 One of the best things about gardening on the west coast of the U.S. is being able to grow Pacific Coast Irises. These are awesome flowers that come in an array of shapes and sizes naturally, and hybridizers here have created even more variety and range from the numerous species found up and down the coastline. While we wait patiently for spring to bring them around again I thought I'd share a few photos of some of my favorites that I have grown. This first photo of a clump of yellow in full, riotous bloom is one of my best PCI photos. This seedling was one of the most vigorous and floriferous I have ever grown. It was also one of the earliest PCis to come to flower, extending the season a bit. Next up is a charming shot of I. douglasiana. 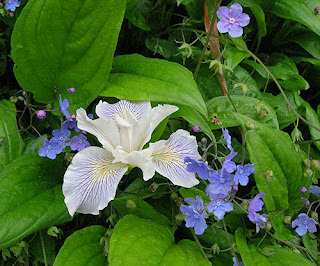 This variety is native to Thurston County, WA, though this specific color no longer grows wild here, as the area where it was collected has been developed for decades. Lavender and white versions can be found in the south of the county along the interstate, but as far as I know, this orchid pink is only in gardens now. I did not grow many named varieties, as they aren't easy to come by, don't ship and transplant well, and grow so easy from seed. I did have this lovely variety though-'For Ruth' (Roy Davidson, 1979). Just look a the wonderful colors as it lights up in the morning sun. Just perfect. Another named variety, 'Native Jewel' (Weaver, 1972), shows off the lavender side of the rainbow. This one was well liked for its very upright stems, a trait sometimes lacking in PCIs, which often do like to arc out wide. I love this photo of 'Poppy' (Edinger/Patterson, 1983). The flower is lovely with wide round petals and a clean clear soft yellow tone, but I also appreciated the beauty of the buds rising together, so I went for this side shot when the opportunity presented. I'll leave you with a seedling I got at a local plant swap. I am head over heels for the cream and lavender colors on this one. And isn't it pretty with the omphaloides? I hope you've enjoyed these photos, and if you live in an area with a dry summer- mild winter climate try growing some PCIs in your garden. Seed is readily available from the SIGNA seed exchange each year. 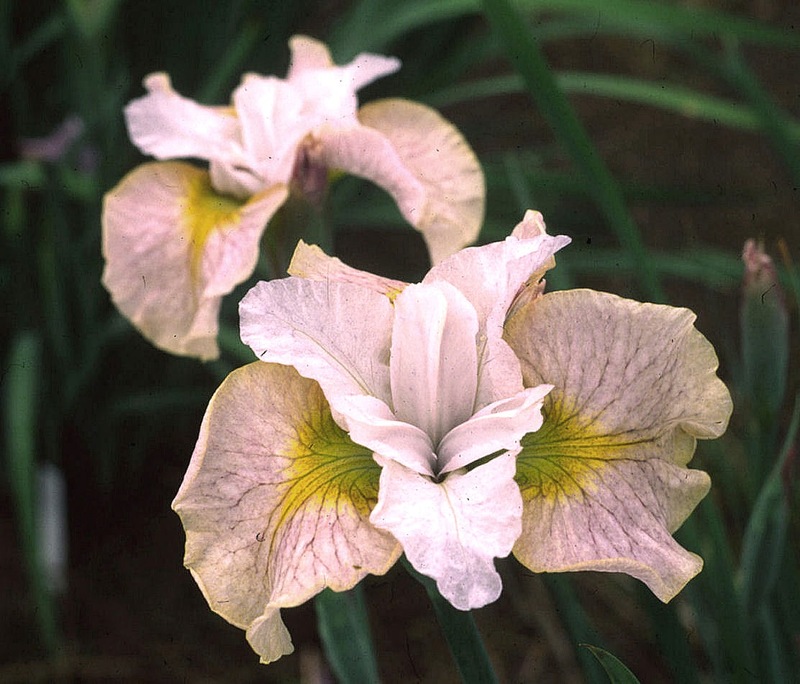 Iris brevicaulis is a Louisiana Iris species. It was first described from a plant found in Jackson County, Missouri on June 6, 1897. It still grows in the same location. 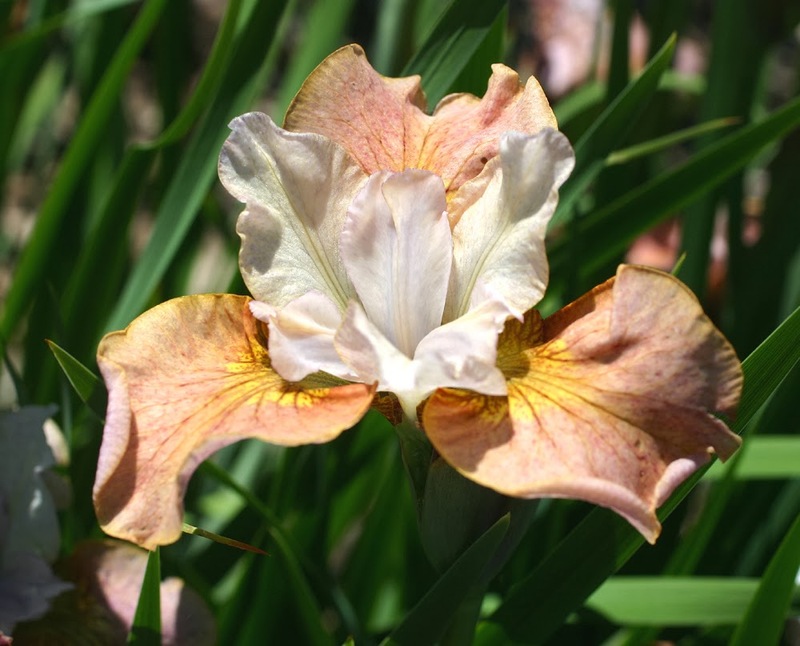 That specimen is considered the 'type' or what all descriptions of this Iris are based upon. It was described and named Iris foliosa, the leafy Iris. 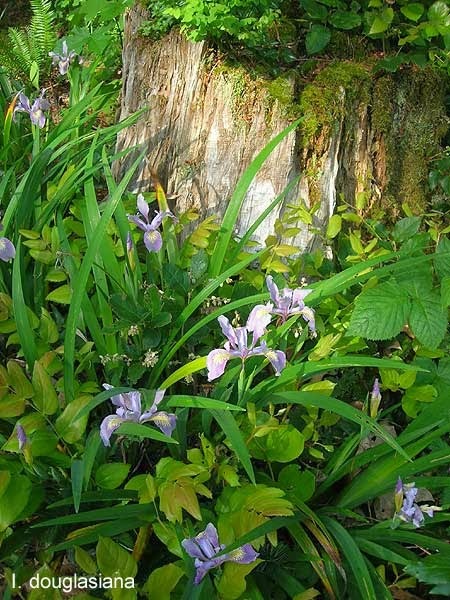 Iris brevicaulis had previously been named, but the description was changed to match I. foliosa and the currently accepted name is Iris brevicaulis, the short stemmed Iris. Above and below: I. brevicaulis from the 'type' location in Missouri. 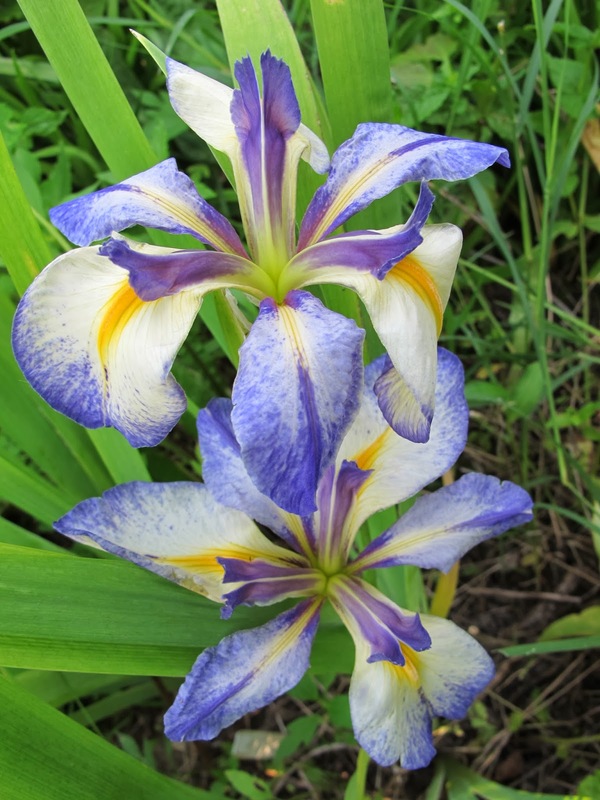 I. brevicaulis is the hardiest and most wide ranging of the Louisiana irises. It has been found from Leavenworth, Kansas all the way to the northeast shore of Lake Erie in Ontario, Canada, as far southwest as The Big Thicket of east Texas and southeast into the Florida Panhandle. Below is one from Alabama. 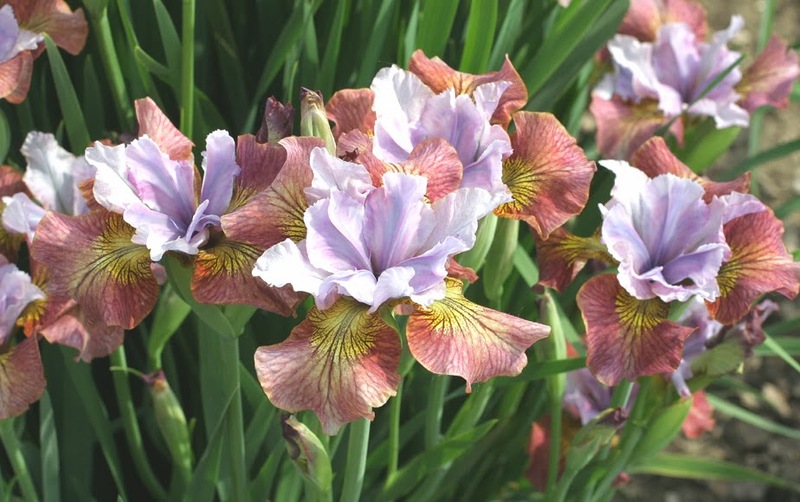 Oh course, as with all Louisiana irises (and the reason for the descriptive name) the greatest concentrations are found in and near the bayous of south Louisiana. I. brevicaulis, however, prefers it drier than the other members of its group and is found above the riverbanks and in moist fields. A purple and a dark blue found in Arkansas. It readily hybridizes with the other Louisiana Iris species and imparts greater hardiness and a lessened need for wet conditions, so it should be used even more in hybridization. Below is an interesting color form, named 'Finders Keepers', selected by Frank Chowning and registered in 1961. There is still much of interest in the straight species and they are worth growing on their own merits. There is also a registered 'All Falls' with six falls and no standards that I would love to see, and several selections of white flowered forms. Iris brevicaulis is the easiest of all Louisiana Iris species to grow and the latest to flower, thus a fine season extender. Consider adding this iris to your garden. Siberian Irises that the World Overlooked - "Lemon Veil"
I may be stretching a theme a little bit to include "Lemon Veil" on a list of overlooked Siberian irises, because it did win an HM, but still I believe it never received the full recognition that it deserves. It was introduced by Bob Bauer and John Coble at Ensata Gardens in 2000. It's pollen parent was "Shebang", and although this is a multipetal type, "Lemon Veil" has a perfectly normal form. (This is not surprising since 50% of the progeny of such a cross should have the normal three fall and three standard form.) The pod parent was a seedling involving a lot of genes from "Silver Illusion" – an iris aptly named because although it was a truly beautiful silvery-blue, it was an illusion that it would survive for most people. "Lemon Veil" is a strong grower, with a pleasing ruffled form and good bud count, but its colors are the main interest. It opens as a pearly, light lavender-pink with strong hints of a pale yellow color underneath that lights up the “pinkness” and ends in a strong yellow signal at the base of the falls. The yellow fades with time, but the final lavender-pink color is itself attractive. Now, 15 years later, this light yellow and lavender-pink combination might attract less attention, but then it was novel and there were some clear hints that the combination could be very attractive and should be explored further. In all, it had its own personality that stood out from the crowd and it still makes a fine garden subject. Certainly it was interesting to me. I kept coming back to it to try to discover just what it had that set it apart, and decided it could be a promising new parent for the red over yellow combinations that represent the biggest advance in Siberians over the last decade with their orange-brown, brick red and cinnamon colors. 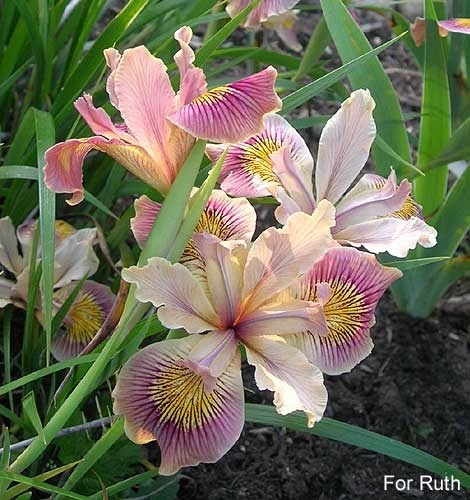 So in 2004 I crossed it with a deep yellow ("Laugh Out Loud") and with an existing brownish-red seedling, hoping to see lots of these new color combinations. In fact, that’s just what happened. One result was "Copper Country" – a lovely coppery brown color. We introduced it in 2008. This was a mistake. Perhaps "Copper Country" inherited too much from "Silver Illusion", because it too resents being transplanted and often quits life without much of a fight. We got carried away with the new color and should have watched and waited a bit longer. However, it has a sister seedling, 06U6A8, which is still being considered, and both have given some interesting seedlings which seem to be more ambitious growers, such as 12S3B2. Taking a second direction, a group of "Lemon Veil" x "Laugh Out Loud" seedlings were treated with colchicine, which is used to convert diploid plants to tetraploid ones, giving more genetic possibilites for different color results. 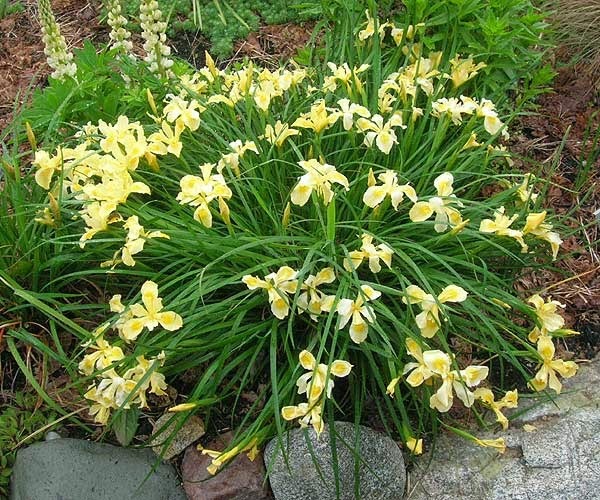 Several of these proved to be tetraploid, and, critically, they were both fertile and vigorous, though blooming rather short. These are now part of an ongoing breeding program for these newer color blends which is showing promising results, e.g. seedling 11R9B3 with the red-violet color on the fall enriched by the underlying yellow. So, I’m hoping all may not have been in vain with this line of breeding. Around the same time that I was admiring "Lemon Veil", so too were Marty Schafer and Jan Sacks. They have done a much better job of producing viable and interesting new varieties from their crosses. These include "Sugar Rush" (2008), "Hot Sketch" (2008), and its sib, "Miss Apple" (2009), all with "Lemon Veil" as the pod parent, all showing red over yellow interactions to give glowing red and pink shades, and all of which received HMs at their first opportunity. I am quite sure there will be more awards to come. The line continues with such newer introductions as "Sweeter Still" (2011), which has "Sugar Rush" as one parent. More recently, Zdenĕk Seidl in the Czech Republic saw something he liked about "Lemon Veil" and has introduced several seedlings over the last two or three years. I haven’t seen these in person, but the photographs are interesting. Here is "Colors of Ostrava" (R2012) from a cross of "Lemon Veil" and "Huntress" which reveals a different way of combining lavender and yellow. John Coble and Bob Bauer tell me that they never got anything they liked from using "Lemon Veil" as a parent, which is surprising because it is certainly making an impact as a parent for others. That reminds me of a discussion some years ago with Currier McEwen who told me that he very much regretted not using his lovely "Ruffled Velvet" much in his later crosses after other hybridizers (me included) had received Morgan-Wood Medals by using it as parent. It seems that sometimes you only get fully appreciated after you leave home.